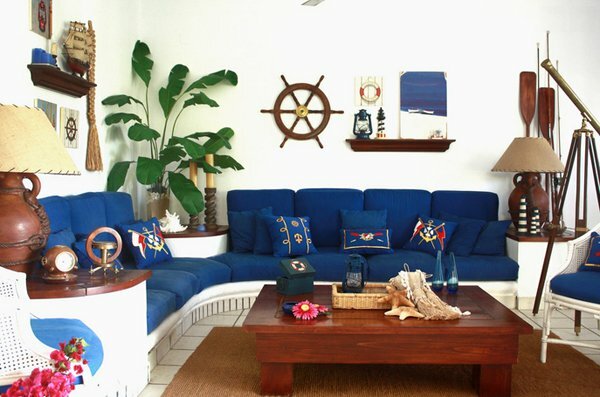 Nautical decorations are totally fascinating – maybe because white and blue and a touch of tan actually look great together or maybe I just love blue too much whenever it comes up in room decorations or whatever, it makes me think that they are really fun and a bit preppy. The stripes look great and is an effective way to make an impact to any given space. We have an awesome list for you today! 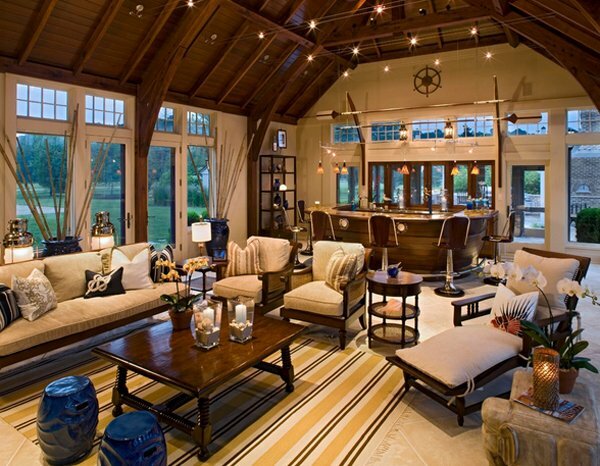 This is a list about nautical home decorations in the living room which is beyond lovely because of the fascination a lot of people have for the beach or the sea. 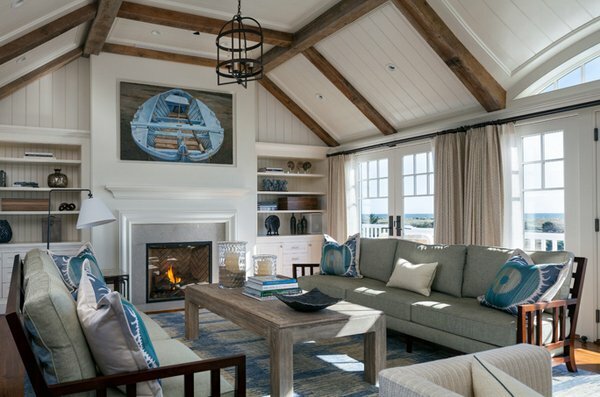 Well, beach homes are pretty similar in color palette with nautical spaces but differ in the feel you have when you are inside the specific room – check out the rooms below! This is a great example of how to create a themed room without its looking cartoonish. 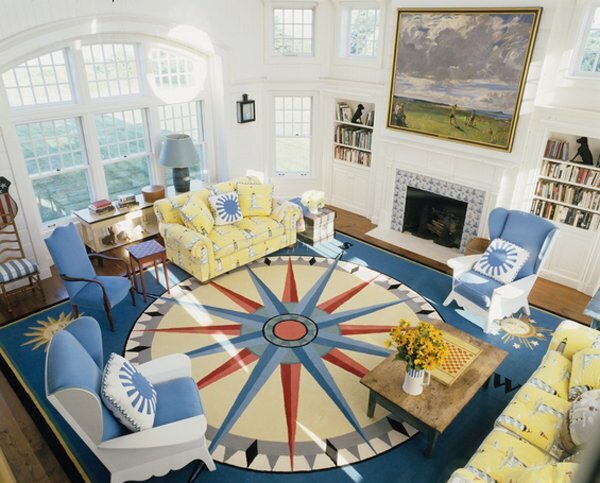 The wood ceiling is a nod to ships, the nautical flags are cleanly framed against white walls, and the nautical pillows and rug are a punch of accent color within an understated color palette. 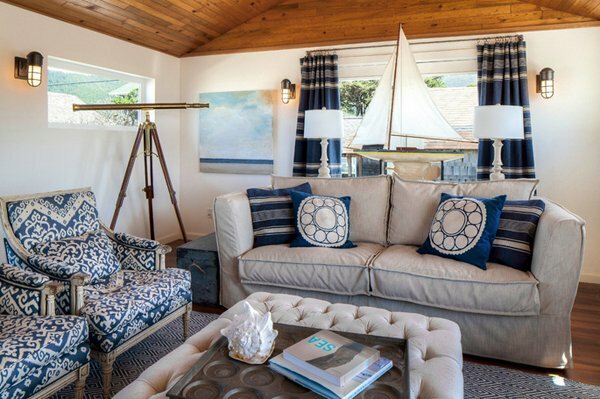 Love that boat painting, and the room is gorgeous! Instead of the wheels being the focal point, they embellish the centered window. 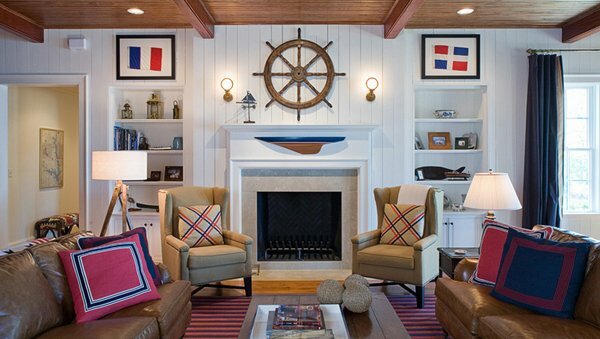 This space feels warm, blends realistic nautical concepts together! 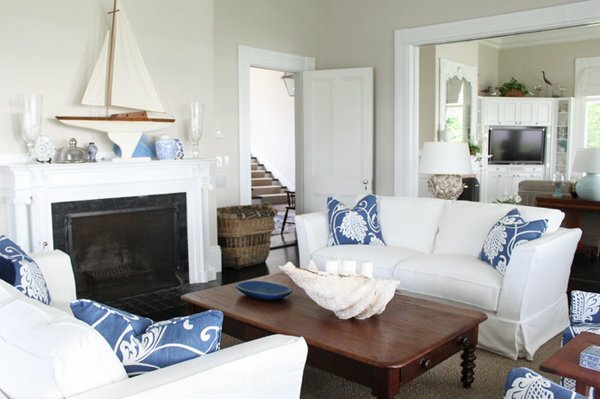 Living room design in blue & white, great nautical touches is bright & cheery! 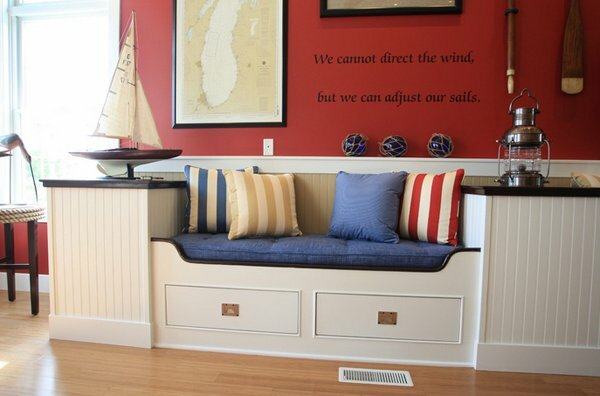 A nautical nook is fun & looks inviting! One often thinks of ship wheels as part of decor that includes dated 1970s paneling, captain’s chairs and lots of other dark wood furniture. Drywall or light-colored painted planks let the wheel stand out as a sculptural object. In this beach chic living room, a mounted horse-head figure and tall candlesticks add metallic interest to the tablescape. There’s an interesting mix of materials and textures on the rustic table: the weathered tray, vintage books and metallic elements. And the starfish is the perfect finishing touch. We brought a 1980’s Boca style house into style with a whole house remodel. It features a classical Bermuda style exterior with clean white cottage details inside. 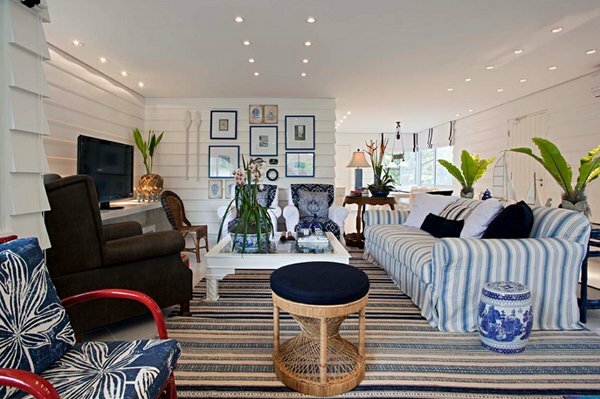 Create a crisp backdrop for clean nautical style. 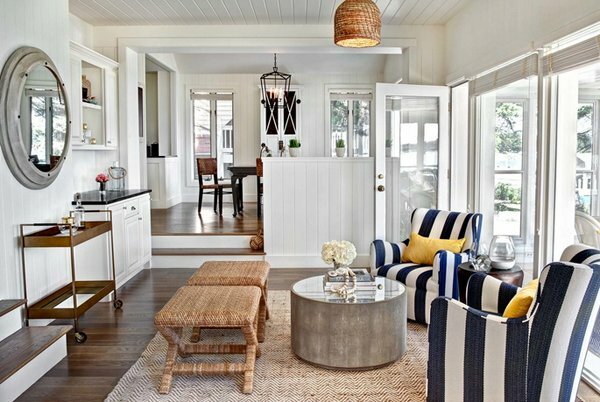 White walls, ceilings and trim make crisp stripes, woven furniture and natural-fiber rugs look even better. And using white on all of the walls throughout an open-concept home is a fool proof way to make the space feel more expansive. I like the yellow accent sofa and design on the carpet. Look at the colors, texture, brass telescope, ship, stripes, patterns – I totally love this living room! This is great for cabins – but recess built-ins so beds are more sofa-like, and add upholstered back/side too. 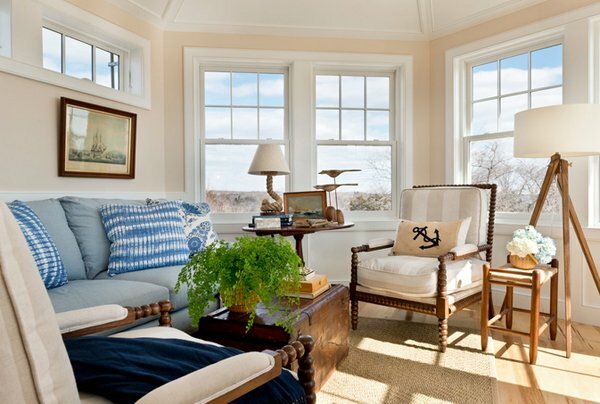 Here woven chairs and storage ottomans in different natural tones mix with vibrant, rich navy shades to create a nautical feel inspired by cottage life – another great use for wicker indoors. Plants, plants, plants galore! Not only will they add a bright splash of fresh green to your space, but they call for an instant ode to the tropics. Place them around the room accordingly to create consistency. 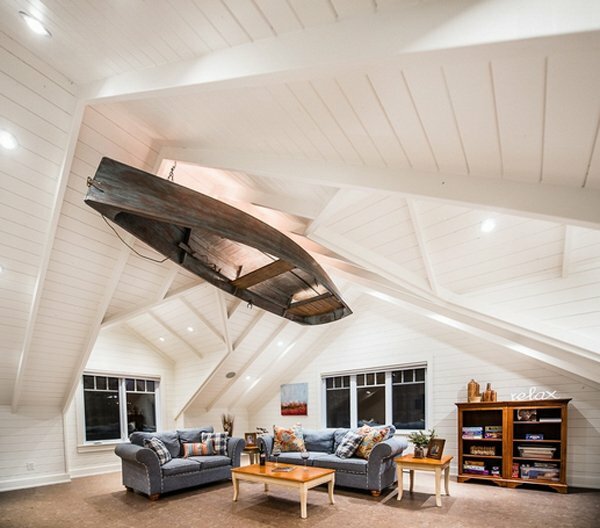 Love the white ceiling with contrast of boat light fixture/art chandelier. 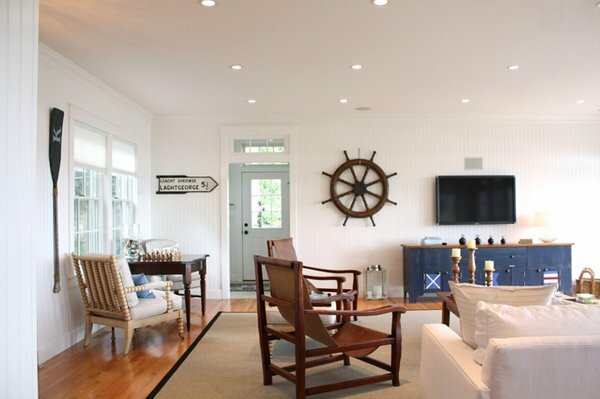 There’s a lot of fun to be had with a maritime theme, especially if you’re partial to antiques. 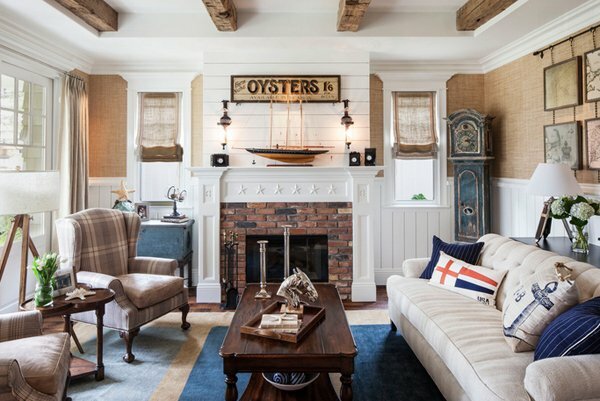 In their charming 18th-century home in the Hamptons, New York, antiques experts Chris Mead and Zoe Hoare decked their cozy cottage with decor befitting an old sea captain’s cabin. 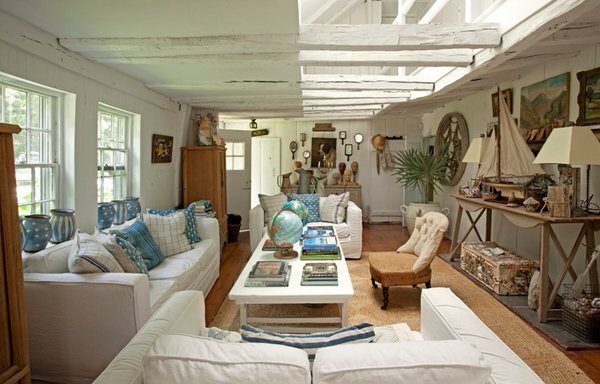 The nautical bric-a-brac gives this living room lots of character! 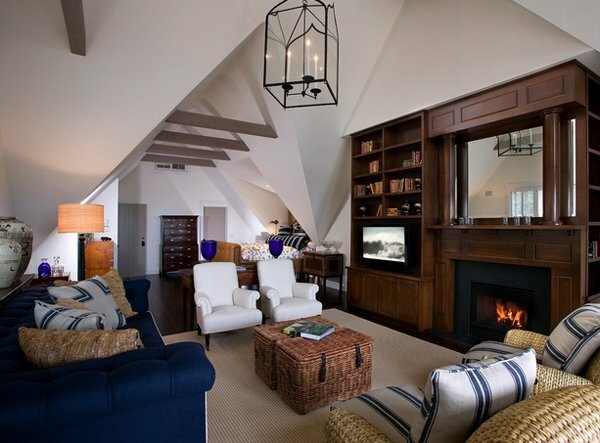 This traditional Chesterfield leather suite is softened with a mix of fabrics in ocean colors. 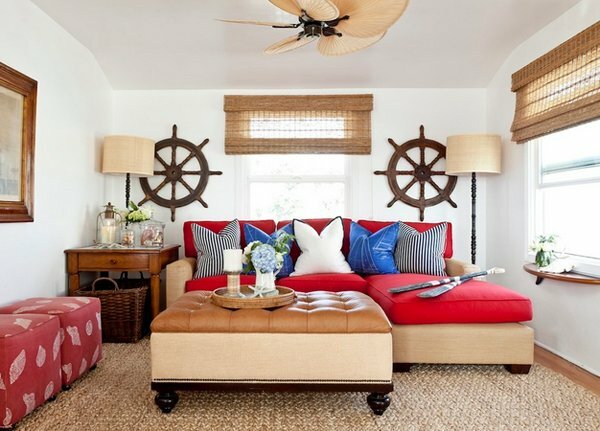 Crisp linens and soft velvets in a coastal palette work well with the life-buoy wall art. Shells give the classic chandelier a twist. 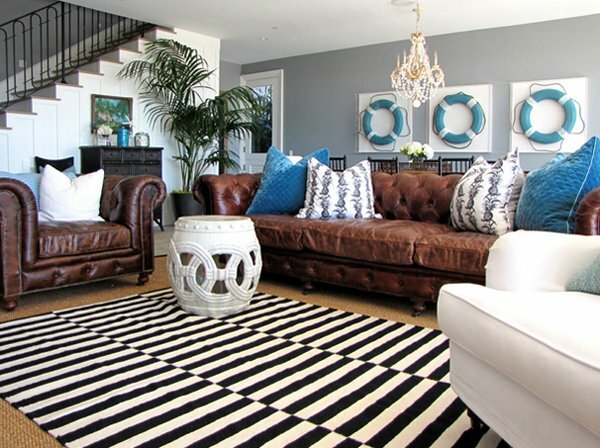 Rugs in bold, monochromatic stripes ground this room. Maidenhair fern can grow to about 3 feet tall in its natural habitat, but varieties produced for houseplants are commonly much smaller. Even when the room designs have the same color scheme, the aura and the additional decors and furniture choices give us a hint if it’s beach or cottage and nautical. I’m pretty sure you have seen the stripes, which are obvious, and the ships and captains’ wheel – we’ll never miss out on that one!